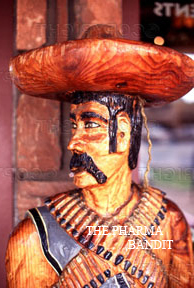 Most of Allopathic bandit medicine is unnecessary and replaceable with others medicine such as Nutritional Medicine. [See: Suppress alternatives]. 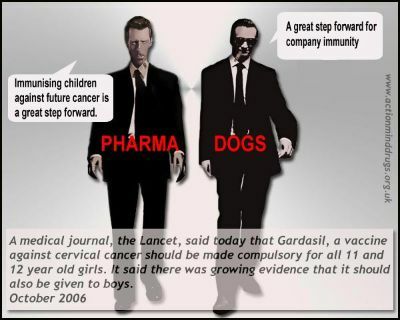 Consequently all of vaccination is a robbery, with the childhood vaccines compulsory, so they managed to make robbery 'legal'. Then with the other ones they make yearly forays while you sleep with old dependables such as flu vaccine and then the odd exotic comes along combined with some other drug such as Tamiflu. No bandit ever has enough money, they just get bigger stomachs and vaults to put it all in. People who can't see this tyrant, or the other ones are called Pyjama People (PJs). Of course every bandit likes to appear close to God so they create or buy out charities to extract any bits of gold they missed through the raid by the legislature. The more you can make compulsory, the better, eg vaccination, and the Ritalin raid is going well---the more they can addict the better, as that is a life long revenue without the hassle of frightening you into taking it again and again. You can forecast a raid when you hear them shout, not 'stand and deliver' anymore, but words such as 'Spanish', 'Flu', 'killed', 'millions', 'die', epidemic', 'HN51', 'Bird flu', 'SARS', 'smallpox, 'anthrax', etc. (See: Daily Fearmongering.) The white collar bandit called the CDC is in charge of these raids, usually to sell vaccination. It conjured up the AIDS Heist out of next to nothing.